Snippets of Jack: "We're Not Back"
Possibly the saddest moment of the series is in The Pirates of the Caribbean: At World's End when Elizabeth finds her father in the land of the dead. We never really learn what happened to Elizabeth's mother, but she is never shown or mentioned, assuming she has passed away. Which only causes this encounter to be even more tragic, because Elizabeth must now return to the land of the living, parentless. When Elizabeth first sees her father while she is safely on board the Black Pearl after saving Jack, she thinks that they've returned. She's incredibly happy to see him in a little row boat amoung many others. "Elizabeth, we're not back," Jack says solemnly. That changes everything. She begins to frantically call to her father. Weatherby Swann: "Elizabeth, are you dead?" Elizabeth: "No. No." Weatherby: "I think I am." Elizabeth: "No, you can't be." The former governor just sits in his little row boat, calmly as he sails to the afterlife. Elizabeth on the other hand, does the exact opposite. She throws a rope overboard to him, asking him to climb on. But it's too late. She tragically screams and cries and you really can't help but feel sorry for her when he doesn't take the rope. He calmly tells her that he's just so proud of her. When they last saw eachother, he was risking his life to get her safely out of Port Royal. Of course, after that she sails around the globe doing tons of dangerous stuff, but ya know. Tia Dalma commands that she doesn't leave the ship, so every on has to hold her back. And eventually she is thrusted into dear Will's arms as she weeps. Now how did Weatherby Swann end up in the land of the dead in the first place? Surely he wasn't on a mission to save Jack. Well, we know that he too is arrested at the beginning of The Prrates of the Caribbean: Dead Man's Chest and taken before Lord Beckett to bargain. "So you see, Mercer, every man has a price he will willingly accept, even for what he hopes never to sell." -Beckett. He utlimately agrees to give Beckett whatever so long as he keeps his daughter safe. 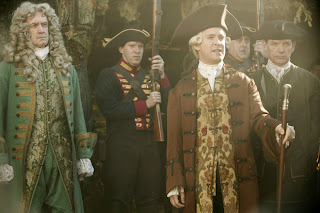 So he goes on a little adventure with Beckett inorder to help him control the seas with Davy Jones. That is, until Beckett decides that he has no more use for him. Mercer: "He's a sly one, that Jones; who's going to kill him, if they know they'll be killing?" 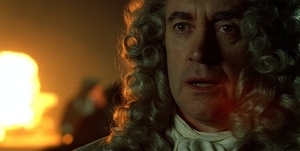 Beckett: "I can order Admiral Norrington's silence. He'll obey; it's what he does." Mercer: "And the governor?" Beckett: "Yes. Well, every man should have a secret he carries with him to his grave." Oh, how we despise Beckett. It's one thing to be cruel to a pirate, like Jack, but it's a whole new level when you execute an oblivious old man who only wants to do whats best for his only child. Thins get a bit awkward when Elizabeth is reunited with Norrington, who has been working for the Royal Navy. James: "Thank God you're alive. Your father will be overjoyed to know you're safe." Elizabeth: "My father is dead." James: "No. That can't be. He returned to England." Elizabeth: "Did Lord Beckett tell you that?" You walked right into that one, dude. "I'll give your love to your mother then, shall I?"